Grand Ayatollah Seyyed Ruhollah Mousavi Khomeini (1902-1989), Iran’s first Supreme Leader, has an interesting hand, and one that collaborates his achievements and also tells us something about his personality. He was a holy man, but does his hand shows that he was genuine? One significant character trait quite noticeable in his hand is his charisma. He has been criticized by the non-Muslim world, but it is clear why people in Iran revere him even now, years after his death. He was a true leader, in both the spiritual and political sense. strong and determined. He also had a formidable will, and was difficult to convince. Check out a photo of his hand here and here. He was not an open personality, keeping his own counsel in matters of importance. Despite this inflexibility, he managed to command the respect of his flock because of his integrity and ideals. Very idealistic, he was also very straightforward, and humble. If there was one word which could describe him, it would be idealism, and yes this is shown in a slightly extreme manner in his character, perhaps befitting a man who led a revolutionary movement. He was not a compromising person, even if practical considerations demanded it. His hand shows that he was likely a volatile personality, and a person with a startlingly dark imagination. This would make him suspicious of others and their motives. This was what (probably) gave him a grimness of personality along with the qualities of Saturn. He was particular about small things, and status symbols were likely important to him. Outward appearances mattered. Overall his hand is in keeping with that of a strong religious leader. Although there is one thing missing from it - that of someone who is open. I have assumed that Khomeini is right-handed. Usually, I find this out by checking photographs of the subject writing, but in Khomeini’s case, I could not find such a picture. The right hand reveals the current state of mind if the subject is right-handed and the left hand the inherited or dormant qualities. I also checked for pictures of Iran’s current supreme leader Ayatollah Ali Khamenei, the successor to Ayatollah Khomeini. I could not find a photograph of him writing either, and neither did I find good photos of his right hand. His left hand shows that he lacks the charisma of Iran’s original Supreme Leader although he is more practical. Read about the Heads of States from different countries. Or read about other Spirituals Leaders from different parts of the world like that of Mahatma Gandhi or Pope Benedict XVI or Mother Theresa. Or maybe you would like to know the difference between Sathya Sai Baba and Sai Baba of Shirdi. 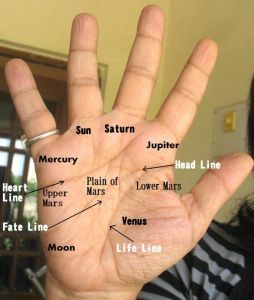 Or check out the hand reading of a modern guru like Deepak Chopra. yeah, why not. I'll check for his print. If they are available then in the next few weeks.